Regardless of the reason you take protein supplements, consuming them long-term may lead to side effects -- both good and bad, depending on the amount you take. Taking protein supplements is a convenient way to meet your daily protein needs. Knowing the pros and cons of protein supplements will help you decide whether taking these supplements for an extended period is right for you. Some people take protein supplements when following high-protein diets to lose weight. Although high-protein diets are often effective for weight loss, some studies have documented certain side effects from following high-protein diets over longer periods of time, such as 12 months. One such study, published in 2008 in the "American Journal of Clinical Nutrition," found that individuals who obtained 34 percent of their calorie intake from dietary protein lost weight, kept the weight off after a period of one year and showed improvements in cholesterol and blood glucose levels. Using protein supplements to meet your daily protein needs, especially if you're an athlete and have higher protein requirements, can help increase muscle mass and maximize athletic performance. 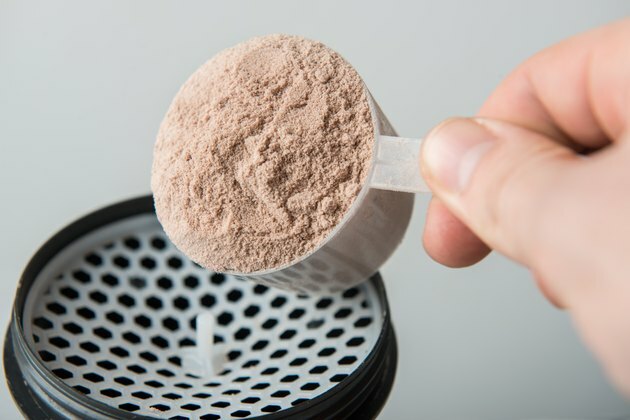 While the recommended dietary allowance for protein for adults is 0.36 gram of protein per pound of body weight daily, athletes require 0.64 to 0.91 gram of protein per pound of body weight each day to meet the demands of regular athletic training, according to the International Society of Sports Nutrition. A few safety concerns arise when taking protein supplements, especially when consuming them in large quantities over the long term. Ingesting too much protein puts an unnecessary strain on your kidneys. A review published in 2006 in the "International Journal of Sport Nutrition and Exercise Metabolism" reported that an excessive protein intake -- which means you're getting more than 35 percent of your daily calories from protein -- is dangerous and can cause a buildup of metabolic byproducts in your blood, diarrhea, nausea and even death. Authors of this review suggested consuming no more than 1.14 grams of protein per pound of your body weight daily. Protein supplements are not necessary to meet your daily protein needs because protein is found in an abundance of healthy foods, such as lean meats, poultry, seafood, eggs, low-fat dairy foods, soy products, seeds, nuts and legumes. Protein supplements are often more expensive than protein-rich foods. Some supplements contain artificial sweeteners, such as sucralose, which may increase your sugar cravings -- and your risk for obesity and type-2 diabetes, according to Harvard Health Publications. Some protein supplements may even contain ingredients not approved by the U.S. Food and Drug Administration.